A sumptuous period thriller encompassing themes of power, love, betrayal and murder, “Child 44” is novelist Tom Rob Smith’s fictionalized version of the grisly case that was met with resounding critical and popular acclaim upon publication in 1998. Real-life serial killer Andrei Chikatilo, also known as “The Butcher of Rostov,” was convicted of murdering and mutilating 52 women and children in Soviet Russia in the early 1950s. “Child 44” continued to be translated to screen, produced by Ridley Scott and directed by Daniel Espinosa where the filmmakers saw an opportunity to blend visceral action sequences with psychologically nuanced character arcs against a rich historic tapestry. To anchor an adventure of such grand historical scope, the filmmakers needed an actor capable of handling the script’s demanding emotional and physical range, from quiet dramatic moments to brutal action sequences. They also needed someone who could subtly express the protagonist’s inner conflicts as he struggles to find his humanity in an inhuman situation. They found their Leo Demidov in British actor Tom Hardy. Regarded as one of the most charismatic talents of his generation, Hardy impressed moviegoers as a violent convict in Bronson, then broke through to a global audience with his portrayal of the evil Bane in The Dark Knight Rises. More recently he earned both critical and popular acclaim for his role as a Brooklyn bartender with a dark secret in The Drop. Hardy says he was attracted to the project by the moral complexity of his character—and the script as a whole. 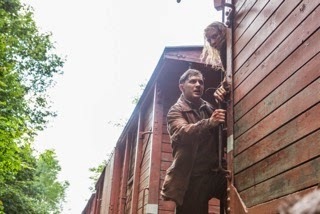 “Child 44” opens exclusively at Ayala Malls Cinemas nationwide starting April 29 from Pioneer Films.